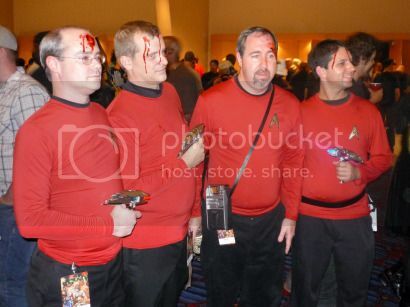 You know why these Star Trek “red shirt” costumes spotted at Dragon*Con are so hilarious? ‘Cause no red shirt lives long enough to start balding. anyway, thanks for the smile, and for actually providing credit for a pic on the internetz. My pleasure, Dot. Thanks for taking a delightful photo.